The right kind of tax reform would generate more growth and also reduce corruption in Washington. Politicians no longer would have the ability to create special tax breaks for well-connected contributors. But we won’t get to the right destination if we have the wrong map, and this is why a new report about “tax expenditures” from the Congressional Budget Office is so disappointing. 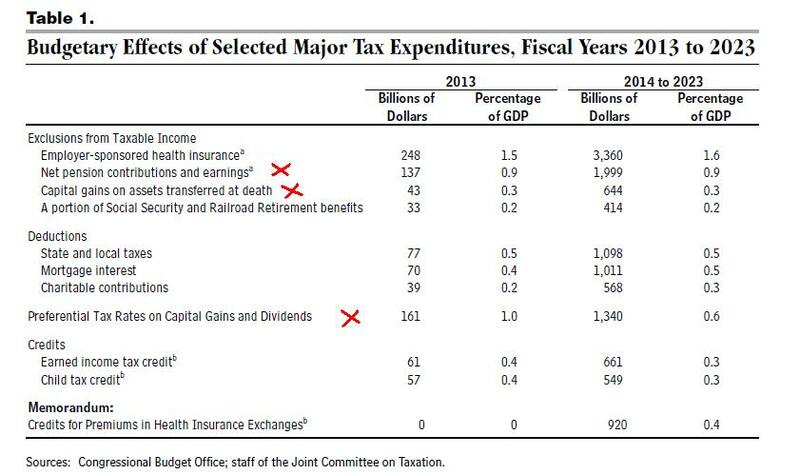 As you can see from this excerpted table, CBO makes the same mistake as the Tax Policy Center and assumes that there should be double taxation of income that is saved and invested. As such, they list IRAs and 401(k)s as tax expenditures, even though those provisions merely enable people to avoid being double-taxed. Likewise, the CBO report assumes that there should be double taxation of dividends and capital gains, so provisions to guard against such destructive policies also are listed as tax expenditures. The CBO report says that tax expenditures will total about $12 trillion over the next 10 years, but about one-third of that amount (which I’ve marked with a red X) don’t belong on the list. By the way, at least the Tax Policy Center has an excuse for putting its thumb on the scale and issuing a flawed estimate of tax expenditures. It’s a project of the Brookings Institution and Urban Institute, both of which are on the left side of the political spectrum. So it’s hardly a surprise that they use a benchmark designed to promote punitive tax policy. To be fair, at least CBO admitted in the report that there’s a different way of seeing the world. …tax expenditures are measured relative to a comprehensive income tax system. If tax expenditures were evaluated relative to an alternative tax system—for instance, a comprehensive consumption tax, such as a national retail sales tax or a value-added tax—some of the 10 major tax expenditures analyzed here would not be considered tax expenditures. For example, because a consumption tax would exclude all savings and investment income from taxation, the exclusion of net pension contributions and earnings would be considered part of the normal tax system and not a tax expenditure. But admitting the existence of another approach doesn’t let CBO off the hook. At the very least, the bureaucracy should have produced a a parallel set of estimates for tax expenditures assuming no double taxation. That basic competence and fairness. By the way, the Government Accountability Office is worse than CBO. When GAO did a report on corporate tax expenditures, that bureaucracy didn’t even acknowledge that there was an alternate way of looking at the data. *Actually, the ideal approach would be to dramatically reduce the burden of government spending, shrinking the size and scope of the federal government back to what the Founding Fathers had in mind. Under that system, there presumably wouldn’t be a need for any broad-based tax. P.S. This new report is not even close to being the worst thing produced by CBO. The bureaucrats on several occasions have asserted that higher taxes are good for growth, even to the point of implying that the growth-maximizing tax rate is 100 percent! And CBO is slavishly devoted to Keynesian economics, notwithstanding several decades of evidence that you can’t make an economy richer by taking money out of one pocket and putting it in another pocket. Yet for inexplicable reasons, Republicans failed to deal with CBO bias back when they were in charge. I note that they did leave one tax expenditure off the list- that is the amount of moneyu they let me keep out of my paycheck. It is so kind of them to allow me to keep some of that for myself, when it would actually be better if I turned it all over to them, and let them take care of my daily needs through a series of vouchers that allowed me to obtain sustenance. Oh- wait they do that already- they call them dollars. And I hear they are printing more every day.